This morning after yoga, where I learned that I can’t do this at all, (I can do the arms, but the legs are not possible. It was inelegant. You have no idea.) I started to feel all zen about the sweater. I started to think that I should let go of the sweater. Allow the sweater to move through me in it’s own time and space. Do not force the sweater, but instead embrace the sweater coming into it’s own being. Let the sweater be only as finished as it can be for right now. Breathe. (This is what yoga does to you.) Then I checked my comments. My little zen-like self (breathe) read how everybody thought it was nuts. (Note to self: when the general response to your plan is “Well this should be entertaining”, you might want to consider the possibility that you are experiencing unrealistic expectations again. 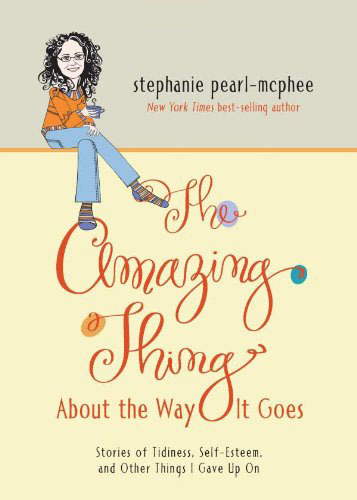 Further to that, when your friends say “Step away from the sweater…” or “Let’s not do this “thing” again” you might want to think over the off chance that your plan makes about as much sense as the time that I wanted to get a miniature sheep and try to convince Joe it was a dog). If you finish that sweater by Rhinebeck, I will buy you a TREAT at the show. (Please insert filthy expletive of your choice here) I am deeply ashamed to discover that this one little comment was enough to completely drop me. That was it. I have to do it. There is no walking away now. You may think what you will about the fact that I don’t even know Claudia, and that I don’t even know what the treat is. You can also infer whatever pleases you about the fact that I don’t even need to know. It could be the shredded reciepts from the bottom of her purse for all I know. It doesn’t matter. In true harlot fashion…the plan is loose. This…(look, I wasn’t kidding about the loose thing) is the pattern. because you know…I’m not letting the fact that I’m clearly delusional and unrealistic keep me from my mitten knitting responsibilities. 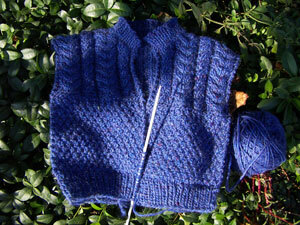 I was reading Claudia’s blog a little while ago, and she’s knitting this awesome sweater to wear to Rhinebeck. (Actually, Claudia’s really sneaky. She’s being all casual about it. She hasn’t come right out and said that she’s making the sweater for that, it’s more like “Oh my goodness…this just might be finished in time”. Very cunning) Then I checked her sister Silvia’s blog, and Silvia is knitting one too. They are having a little sisterly competition, both rushing to finish new sweaters for Rhinebeck. Isn’t that nice? 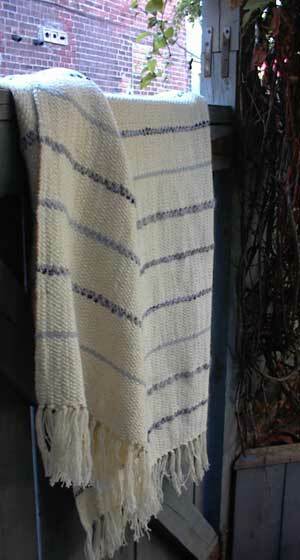 New sweaters for Rhinebeck. Now you may not know this about me, but I have a tiny competitive streak. (Somewhere, my buddy Ken just read that and is laughing himself stupid. He’s at his desk, snorting coffee and laughing maniacally while his co-workers stare at him and wonder if he’s finally so far gone that he thinks that the geeky network administration he’s working on is funny. Ken has been on the receiving end of my tiny competitive streak more than once. There was the “Who can make the smallest origami crane” episode, and a really spiritually unhealthy time with matching sweaters. I digress, but before we get back to the blog, I feel compelled to point out that I soundly thumped him.) This little flaw of mine is compounded by my need to not be left out of any fun that anybody is having without me. This means that even though there is only 14 days before I get on a plane, I must have a new sweater. Must. Have. I know this is wrong. I know that I am a pathetic mess of a knitter, I know that I will likely have to warp the time space continuum to get a sweater before I leave, but all of this doesn’t matter to me. I’m thinking about an imaginary sweater. 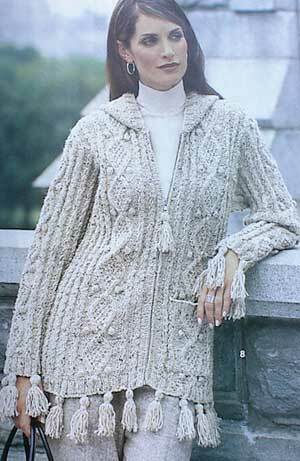 In my imagination, this sweater is a sort of fitted aran cardigan, with a zip front and saddle shoulders. I have a 90cm bust (36″ ) and I think that a sweater 100cm around would do. (That’s like…4″ of ease) I have been through the countless books and magazines in this house (sort of quickly though, I can’t waste valuable knitting time) and feel confident that the pattern I want does not exist. That’s ok. I can fake it. The only thing standing between me and a Rhinebeck sweater that will keep all the other knitters from pointing, laughing and demanding chocolate while I try desperately to defend and redeem myself with a pair of Latvian Mittens is a deep concern that I may not have enough wool. 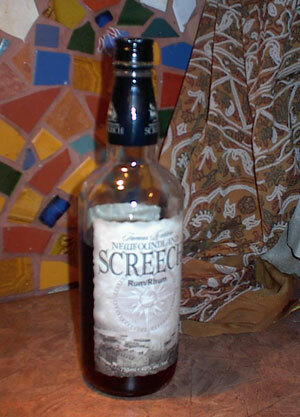 I embarked on a little research. This actually isn’t relevant, since swatches are known to be filthy little liars, still..I feel compelled to knit them, since every pattern book I’ve got says something like “to save time, take time to check tension”. Since this knit needs to be fast, I thought I’d better do it. It hasn’t helped so far, except to tell me what I already knew, which is that I’m getting about 19 sts to 10cm. That’s good. 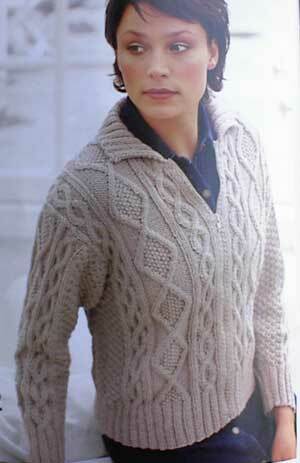 Next, I found two sweaters which are sort of like what I’m thinking about, and checked their gauge and yardage. Here’s where it gets weird. First….this one. Design #8 from Vogue Winter 00/01. Calls for 1670 metres of yarn. I’ve got 1240. I was briefly discouraged, but I don’t want a hood, I don’t want it that long, and I’m frowning on the tassels. That should mean that I’m ok…right? Maybe. This is design #2 from Patons book 500982. It’s more like what I want, the length is better, it’s more fitted…this sweater will probably be a closer indicator of what it will actually take. I check and (brace yourself) 2400 metres! I’m being lied to. One of these patterns is lying. They take the same weight yarn, they have the same gauge, they are knit on the same size needles! How can they be that different? I’d just take the chance, but this is yarn from Newfoundland (long way to go for another skein…and they couldn’t even mail it on my psychotic Rhinebeck schedule) and I can’t bear the idea of busting myself for the next two weeks only to end up with a vest. What I need now is a tie breaker. Ideas? Anybody got the yarn requirements for something similar hanging around? next round – *K1, K2tog, repeat from * around. The next round should be a thrum round again, work that round and then K2tog all the way around. Break the yarn, thread through the remaining stitches and fasten off. Carefully pick out the waste yarn, picking up the “live” stitches as they are released. Last round: K2tog all the way around, break yarn, thread through remaining stitches, draw tight and fasten off. 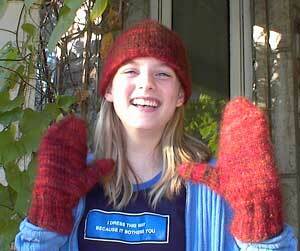 Celebrate your finished thrummed mitten by turning it inside out and laughing until the neighbours think you’re odd. Make the second mitten the same. I have decided to retire from my office as “Queen of the World”. I thought it would be fun, but it turns out that there are many things which remain the same, and I have compiled evidence which would make is seem that I was only a pretender to the throne. 1. I could be wrong, but I sincerely believe that the real Queen of the World does not have to scrub the toilet. 2. The real Queen of the World would not be completely broke. 3. As I was shopping for, cooking for and cleaning up after dinner for six, I thought…this is wrong too. 4. I spent hours this morning feeling decidedly dejected and un-queenly when I tried to add a bunch of people to the Thrum-a-long list, and after a period of really, really un-regal smashing about and swearing during which I drank more coffee than is good for me and thought about the screech (even though it was 10:00 in the morning) I discovered that the whole crapping list was not working because I had used “>” instead of the reverse. How many alcoholics and weird, twitchy, overcaffeinated reclusive freaks do you think that html creates every day? 5. The Queen of the world does not almost give up on the stupid Html because she really can’t spare any more laundry time. Also, nobody tries to have the “underpants talk” with the Queen of the World while she tries to figure out html and looks hostile. (NB The “underpants talk” is always swiftly followed by my standard rebuttal, Speech 93-b, subtitled “Don’t talk to me about your underpants, you know where the washer is”. This rebuttal, while well-practiced, is wholly ineffective, but may be somewhat Queenly). 6. The Queen of the World is not so thrillingly outdone by Thrum-a-long Co- hostess Crystal, who posted a clever and helpful tutorial on the art of the thrum, for those of you who find the Harlot method lacking. 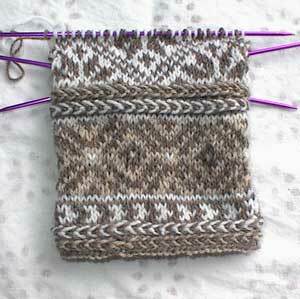 I made little progress on the thrummed mitten, but did work past the thumb so that I could cheerfully bring you…. 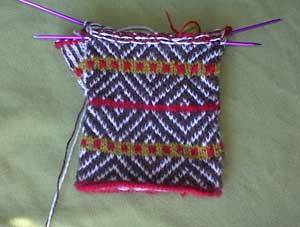 Having worked your merry way up to the placement for the thumb (I assume that if you think the thumb is in the wrong place, you will work more or less rows of the thrum pattern ) we embark on an afterthought thumb, but preplanned. Knit 2 stitches, then using waste yarn Knit 9, knit to the end of the round. 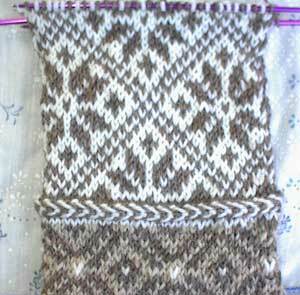 Continue knitting (maintaining the thrum pattern) until you think the mitten is almost as long as the recipients hand. Your work looks like this. In a bold and foolish move, I’m making a commitment. The Canadian version of the Mason-Dixon sewing up party for Afganalong for Afghans, will be held here in my tiny and untidy house, Sunday the 7th of November at 2 in the afternoon. While I cannot even begin to top the extravaganza that Ann and Kay held, I promise to bake a cherry upside down cake (with cherries left over from the ordeal), provide some sort of plonk, hose off the kitchen and drag the extra chairs up from the basement. -good karma. Luckily, the more squares you sew up, the better your eternal soul does. -the good feeling that you can only get from entering the home of someone who is a worse housekeeper than you. 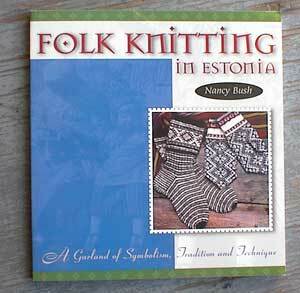 -the chance to play with wool. -the opportunity to join in a worldwide movement to better the lives of those less fortunate than you (no matter how untidy your house is), just by playing with wool. Ann and Kay are sending the squares, for the love of yarn, don’t make me sew them up all by myself. I’ll comfort myself with the plonk, eat all the cake….not pretty. I’d like to take a moment to point something out. Even if you don’t give a rat’s arse about the Thrum-a-long….See that!!! It’s a link! A link to a page that I made. All by myself. That’s right. ME. Now look down the side of the blog…see that? Links to thrum-a-longers! Names! Centred! Who do you think did that? Right again. ME! I have an odd urge to scream things like “Who’s your Daddy!” at the screen. I’m sure it will pass. I was so happy when it finally worked that I laughed out loud and made the cat look at it. If I missed you on the list of Blog-a-longers just let me know. I can fix that. While ranting around the house alternately screaming and typing things into the computer this weekend, I actually knit. That’s right. 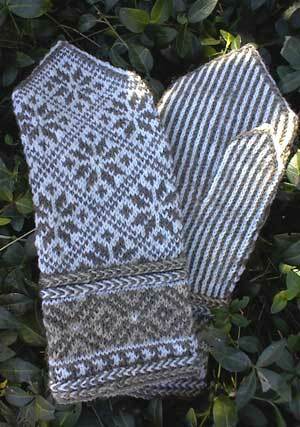 I coded html and I finished the Latvian mittens. (I reiterate…Queen of the world). 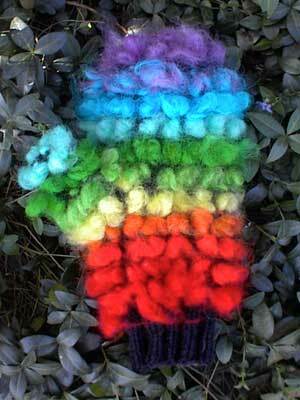 I finished the Fleece Artist mittens, and there was so much left over that I knit a hat to go with…. but I’m starting to feel like it’s an unhealthy obsession, so let’s just glide right over that. Thrum-a-long Madness – day one. After a stunningly successful dye episode in the kitchen, (Queen of the world, I tell you) I deftly defended my fleece from the fibre-stealing squirrel in the backyard, carded and combed and I have this to be the thrums for my mittens. Yes, I know. How many mittens are you making Steph? I got a little carried away. 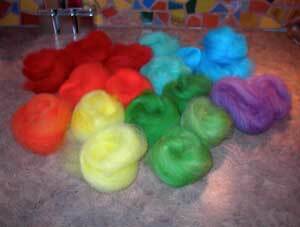 60 grams carded fleece or roving. dpns in 3.25 and 4 mm. 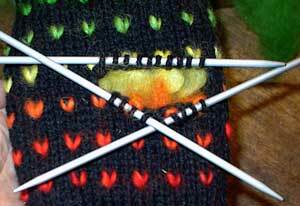 Cast on 40 stitches, distribute on the dpns in a manner which pleases you, and join in a round. 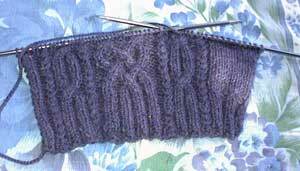 Work in K2, P2 ribbing for 6cm. 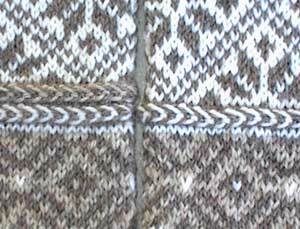 Next round: *K2, knit into the back of the next stitch and its thrum, repeat from * around. That’s usually trouble, isn’t it? I was thinking about the thrum along that’s starting here Monday, co-hosted by the clever and lovely Crystal. 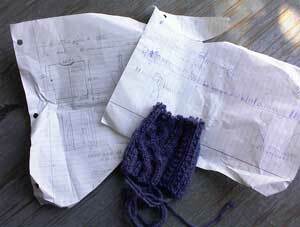 (Crystal has put up a free pattern for thrummed mitts too…they are here) and figuring that I need to do a bunch of stuff. 1. Buttons. Everybody has these funky buttons when they do these. Lucky for me, Crystal organized that. 2. Something to link the button to. I’m working on a Thrum FAQ, and I’ll put that up sometime over the weekend (details on Monday) just as soon as I figure out how to add another page to the blog. So far my efforts have resulted in me feeling inadequate, harassing Ken at work, and drinking way too much coffee. There has to be an easier way. When I have a victory over the blog, there will be something for you to link to. 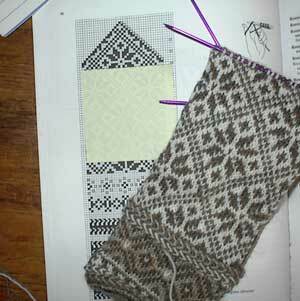 You know you have blog stress when you are knitting Latvian Mittens to relax. 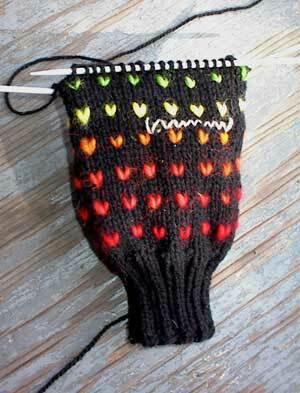 For the love of wool…if you see anything wrong with this mitten, don’t tell me. 3. A list of Blog-a-longers. Where should I put this? Here? On the Thrum page? (I’m leaning toward here. Partly because we all hang out on this page, partly because I already know how to add stuff to this page and partly because the other page sort of only exists in my imagination.) If you already left a comment that you are thrumming along…I’ll add you, otherwise..just let me know and I’ll add you. Crystal will have a mirror list on her site (I think). 5. I guess I’m going to need something to thrum. What I really want is the Fleece Artist kit, but I am respecting the Yarn Diet (sob) so I’ve got this going on. We’ll see what comes of it. (Insert evil laugh here). Joe took one look at this little dye-plan in the kitchen this morning and just quietly went to work. Probably smart. My dye plan is…er, let’s call it “loose”. I’ve got some colours and some fleece, Denny’s crock pot and we will just see. 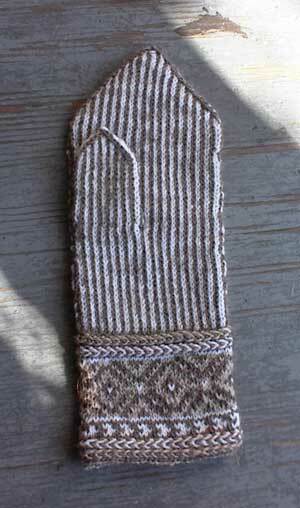 If I’m knitting plain thrummed mittens come Monday…we’ll just pretend this never happened. One of my favourite expressions is “The universe seeks balance”. I really believe it. Water seek level, happy things are followed by sad times, snow after summer, light after dark. In the end it all comes out more or less even. Some days it can be pretty hard to connect with the cosmic wisdom of it all. You know, those days where the guy who is supposed to pay you doesn’t, the dishwasher starts making an expensive noise, You pull a muscle in your arse doing yoga, you start making lists of the things that you like about your family, just so that you don’t strangle them all (I love Sam because expensive things make her “nervous”), your favourite pants in the whole world have a rip in the knee, and it turns out that your Latvian mittens are a stinking pile of crap? You know, those days? Those are the days that I have to remind myself that The Universe Seeks Balance and that it will all eventually come up even. I didn’t have to wait long. The Universe was totally on her game yesterday. The Top Ten Reasons That It Turns Out That I Was Right About The Balance Thing. 10. My brother brought me a jar of Wasabi Peas. He promised me they were good and Dude didn’t let me down. New favourite food, Wasabi Peas. 9. Norma is seriously funny. It is signed by the goddess Nancy Bush herself. I am not worthy. 6. I pulled back the mittens and re-knit them. It turns out that they aren’t a stinking pile of crap. I like them again. I even believe that I may finish them. (See that? Didn’t say “would”, I said “may”. As Claudia knows, it is important not to anger the knitting goddess. She is vengeful and her fury is mighty, cruel, swift and pointy. 5. I got to go the the S&B at Lettuce Knit last night. I left the house, I saw other people and I came home after dark, just like a real grown-up. Jane was there and putting a beaded cast off on a Harlot poncho that was to die for. Aven was there and I got to meet Dani, complete with her finished Klaralund! Laura was there, working on a really neat noro bag. Scads of other people were there, Joyce and….Damn. I’m really bad with names. Fun, nice people. 4. Some months ago, my friend Denny told me that I had to give her anything in my stash that was 100% natural fibres and more than 10 year old. I gave her some stuff, no idea what she was up to. Some weaving thing. She made me a cool spindle bag the last time I gave her stuff. I gave her this cream coloured thin yarn that had never really grown on me. Last night, Denny gave me this. It’s a shawl/table runner/scarf thing. (Denny is the Queen of the multipurpose item.) She wove my…well, what I thought was crap, together with this pretty organic silk stuff and stripes of random blue yarns. There’s some Fleece Artist, other peoples leftovers…even some Handicrafter cotton. It’s to die for. 2. My Husband is so confident about my knitting prowess, that (lest any of you think him unkind for pointing out the missing braid) that he asked “Why” I had made them different. He has such faith that he figured it had to be on purpose. 1. I lost my temper and kicked the dishwasher for making the expensive noise. (It was also not spinning the washing arm thingie). While it is probably too soon to tell, it would seem that I fixed it. You might not want to stand to near me today. In the interest of “Balance”, I’m probably going to be struck by lightning. I buckled down and applied myself to the Latvian Mitten. I made pretty good time too. I knit around to the place where I wanted the thumb, then cast on the stitches that will be the top of the thumb hole, then put the stitches that would be beneath them on a thread to save for later. Then I just keep knitting the mitten (with the thumb hole sitting there taunting me), until I’m ready to knit the thumb. I come back, pick up the stitches on the thread, pick up the stitches from the cast on edge, and I’m off like a prom dress. I knit along after the thumb-hole feeling pretty darn good about me and my ability to resist temptation. I’ve got all these incredible alternatives and yet, do I run off and leave the second Latvian mitten like a common…well, Harlot? No. I do not. I dedicate all of my knitting time for last evening to having a second mitten. I stick to it, darn it…and I’m feeling pretty good about it. When I can no longer keep my eyes open, I spread the mitten on the chesterfield and show it to Joe. “Pretty nice eh?” I say, with the smug and satisfied smile of a knitter. “Yes, Ma’am” Joe replies. “Pretty nice indeed”. We sit for a moment admiring the mittens. We feel the love. I can’t talk. I have a lot to do. I have to do laundry, rip back the mitten, do some of my real job, dust, vacuum and put all of my dpns in a pile on the living room floor and throw myself into them and roll around until I (hopefully) get a fatal puncture. Busy, busy, busy. The CDC is today warning that a knitter in Toronto is showing advanced signs of a disease which may be a breakout of SMS or Second Mitten Syndrome. As you know, there are three forms of SMS. Viral: Viral SMS is common among knitters and most knitters will have contracted it several times during a knitting lifetime. The mildest form of the disease, VSMS is mostly uncomfortable. 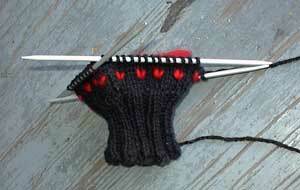 Having Viral SMS may confer some immunity, since most knitters do go on to knit second mittens. The knitter may consider beginning other projects, but returns to the mitten out of a sense of duty and a desire to have a pair. Treatment: Symptomatic. Occasionally, starting another project helps, although it is generally not recommended. Other knitters may support recovery by refusing to go along with the knitters wish that the first mitten be overlooked. Prognosis: Excellent, although some knitters take many months to recover and knit the second mitten. Bacterial: Bacterial SMS is more serious. We suspect that it may be spread by bacteria living on the wool the mittens are knit with. 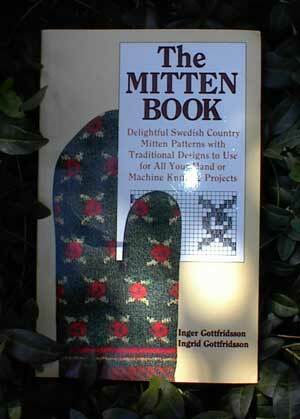 It too is widespread, and has resulted in many single mittens left scattered across the world. 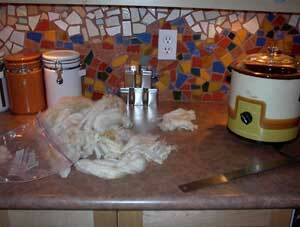 The bacteria responsible seems impervious to heat or cold, since mitten knitters in all climates are affected. Prognosis: Fair. 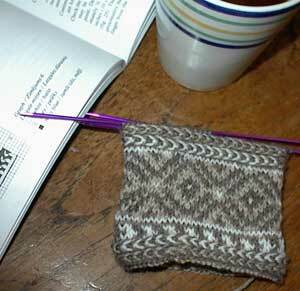 The mitten knitter may recover and a pair of mittens is still a possible goal. Malignant SMS: This variant of the disease is terminal. The second mitten will not survive, and in fact, may never be cast on. There is no treatment for this form of SMS and it leaves a vicious swath of single mittens in it’s path. In this most heinous form of SMS, the mitten knitter is forced to endure the most painful of outcomes. 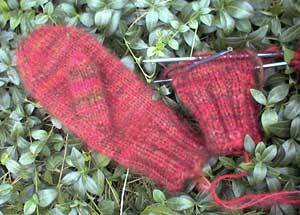 She/he cannot cast on the second mitten, yet cannot admit this and is forced to keep the projects, unfinished for many, many years. 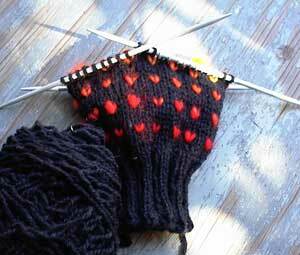 Symptoms: The knitter no longer uses adjectives to refer to the second mitten, and may instead appear dazzled and say “What mitten?”, even as they are surrounded by piles of single mittens. Treatment: None. The knitter should be supported in her delusions to avoid having SMS spread to other areas of her knitting. Prognosis: Poor. Short of getting Captain Hook’s address, there is no happy ending. Damage may be minimized by keeping the knitter from starting up with sock knitting. Our Toronto knitter, while the final verdict is not in, appears to be suffering from the Bacterial form of the disease, which in this case would seem to have been transmitted by a simple knitting book, sent to her by our Lady Kern of the comments. This gift is tempting the poor knitter to thrust the Latvian Mittens into a crack in the chesterfield and cast on something which will be even more beautiful. Despite the horror of contracting this disease, the Toronto knitter appears incredibly grateful. On Friday, when we last saw our faithful harlot, she was chugging merrily along on the insane Latvian Socks and feeling pretty good about it. 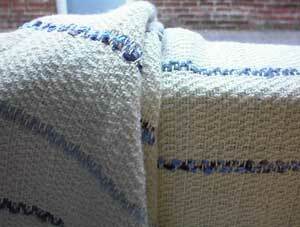 Her Thumb Anxiety© had abated due to a brilliant rescue by Laura at Fibertraditions. Thus armed she was ready to sink into the foxhole of mitten knitting and rise triumphant this morning, having straightforwardly knit the rest of the mitten. 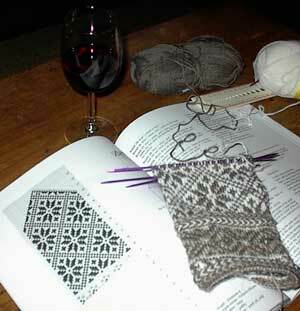 Friday night, while lying in bed I got to thinking about the mitten. I got to thinking about the way the pattern suggested that you knit to the point of decrease, then adjust the length for whomsoever the mitten is for, and then decrease. Seemed smart enough. Except for, (and this is what was keeping me up) if you did that, it seemed to me that you would have a mitten top that could end anywhere in the pattern. I didn’t want that, I wanted it to end with the pointy part of the pattern landing at the pointy decrease. In fact, the more I thought about it, the more I wanted it. I couldn’t just lie there while my mitten might be decreasing in the wrong spot. 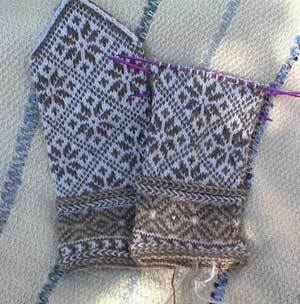 Who could sleep with a misplaced pattern on a Latvian Mitten? I got up and went downstairs. I looked at the mitten. I had altered the pattern by taking out a row of motifs that I didn’t care for, and had compensated (without bothering to see if I needed to compensate) by starting at a different point in the pattern. I looked at the pattern and I got a bad feeling. I started feeling like if I finished the mitten the way it was, then I wouldn’t be getting the pointy pattern in the right spot. It might be too long, or too short if I tried to do that. I got a glass of wine, a ruler and a good attitude, and sat down. I measured it. I was right. There was no way. I looked at the mitten, I thought about ripping it back to the second braid and starting at a different point in the pattern so it would work out. I asked myself why I can’t seem to learn that row gauge is a mystic art. I asked myself what reasonable person overlooks row gauge over and over and over again. I asked myself if I could live with the mitten the way it was, or if it was worth the rip? I thought about ripping back half of a finished mitten, and the more that I thought about it, the more I thought that I should learn to love the mitten the way it is? I mean, why am I always forcing my knitting to be something it doesn’t want to be? Why can’t I just accept the Zen of the mitten? I decide that I will accept my mitten and allow it to decrease at the point that feels right to it. I go back to bed. Twenty minutes later I am up and ripping. There’s just no way. If I didn’t rip it back it would stare at me for the rest of my life. The mitten would call me things like “slacker” and “coward” and it would belittle me and my half-arsed skills for many years to come. Over the years the mitten and I would never really be able to re-capture the feeling of our salad days, back when I knit it’s braids. It would never really open up to me and I would grow to resent it. I would start to apologize for it’s non-pointed patterning at cocktail parties, and the mittens would say that it didn’t matter…but everyone would know that it wasn’t true. The distance would grow until one day in March when I was wearing the mittens on the subway, and the weather is a little bit un-mittenish, just at the point when you might not get frostbite without mittens, and I’d get off at my stop and walk down the street and suddenly realize that the mittens aren’t with me. That I’ve left them, or maybe they left me…it doesn’t matter, because it was doomed from the moment that I couldn’t commit, rip back and make it right between us. I went back, I did the math (row gauge is a pox on the earth) and figured out where to start if I wanted a pointy ending that was also the length of my hand. The rest of the weekend was spent making up for lost time and feeling the possibility of my perfect future with the mittens all come together. See what I mean? See how it would have never worked between us without the pointy goodness? See how I’m clearly not out of my mind staying up nights worrying about mittens? That would have kept anybody up. Except Joe, I tried to explain it to him when he asked why I was up ripping back mittens in the dead of night. He just gave me that look again. Wanna see the palm and thumb? Yeah baby. The thumb is almost enough satisfaction by itself. It is perfect in it’s striped thumby perfection. How could I have had this thumb on a substandard mitten? This morning when I went to my mailbox, I could see that it was all coming together. 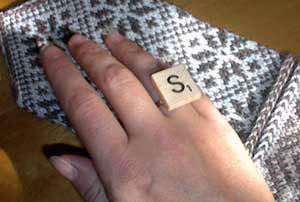 If I hadn’t pulled back the mitten, then I wouldn’t have finished this morning, and If I hadn’t finished this morning then I wouldn’t have gotten this super cool scrabble tile ring from Carolyn just as I was finished. It felt like a party. Thanks Carolyn! I’m going to admit something publicly, own up to the fact that it isn’t an intellectual pursuit of which I should be proud, you may all mock and belittle me for one day and then we will move on. I watch Survivor. That’s right, I do. I understand that it is humans at their worst, and that I encourage the morally repugnant practice of scratching and clawing at your fellow man for money by watching it…but I can’t help it. I love it, can’t get enough. I know that this must run contrary to everything you all know about your tree-hugging, vegetarian, leftist, book reading Harlot….but there you have it. I love it, I read webpages analysing every inane minute the next day, have long conversations with my friend Lene (That’s right chickie….I just outed ya) about each and every dumbass move the contestants are making and speak confidently about how I would have been a fire making expert before I got there. (Wouldn’t you? Seriously, 18 people thrown on an island with no fire. Every single time. If you knew you were going to be on Survivor, wouldn’t you have spent as many obsessive hours in the backyard as it took to be able to make fire pretty reliably? Cave men did it 40 thousand years ago for crying out loud, surely one stinking modern contestant could manage.) Never mind, the point is that I get a little sincere about Survivor. 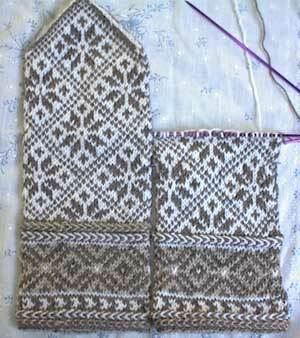 I set myself down in front of the TV, and have a profound period of focus for an hour, during which time I can scarcely drag my eyes from the screen and therefore can’t work on the Latvian mittens during this time. 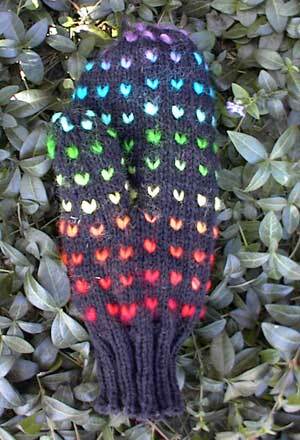 I worked on the Rainbow Peerie socks, and finished the first of the Fleece Artist mittens (but I used my own pattern). You may all scoff openly now, but I bet that you do it too. Don’t tell me that you’ve never shunned a sub-titled film at the video store because you were working on fair isle. Picked an intellectual movie with lots of talking because you knew that you didn’t need to look up from a Latvian braid, how about choosing to knit plain socks so that you could watch all the action in a James Bond flick? You know you do it. You will note that the second set of braids run in a direction opposite to the first set. This is a triumph of an intensely personal nature. I am now poised to begin the thumb, which frankly scares the begeebers out of me. Seriously, I’m afraid that I’m going to wreck the whole work of art with a crappy thumb. 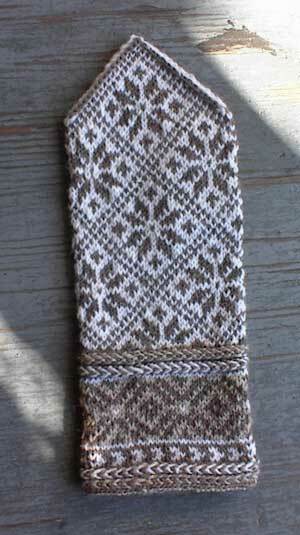 All those braids, the perfectly even fair isle….I can’t seem to bring myself to stick a thumb in it. So you probably don’t want to hear that one of the very first things I did with 2 colors of yarn was a pair of socks with 6 braids each, huh? Yeah, I didn’t think so. 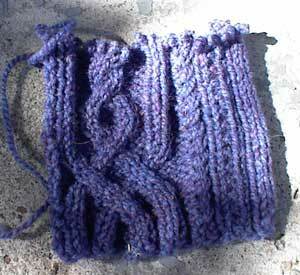 Once you accept the twisty yarn will go away in the next row, braids are great. Very very strange. 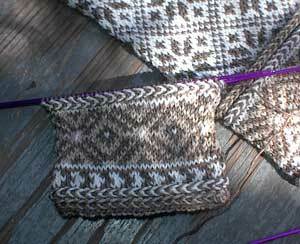 I can knit these braided edgings MUCH faster than K2P2 ribbing, they just fly by. Hmm. Do you hold one color in each hand? And they really do look great, I’d do them even if they took an extraordinary long time. After thinking about this comment for a really long time, I’ve decided that she’s messing with me. Right?